Langkawi is a cluster if 99 islands and is part of Malaysia. The main and the largest island is known as Pulau Langkawi. It is considered as one of the most beautiful islands in the whole of southeast Asia. Langkawi is located at the north-western part of peninsular Malaysia and on Andaman Sea. It is adjacent to and south of Thailand. The islands are separated from the main land of Malaysia by the water channel known as the Strait of Malacca. Langkawi is actually an extension (a district) of the state of Kedah in Malasia. From Kuala Kedah, it is 51kms off shore and in the north west. However the nearest point on the western coast of Malaysia from where one can reach Langkawi is Kuala Perlis. Langkawi is only 31kms off shore from Kuala Perlis on the west. 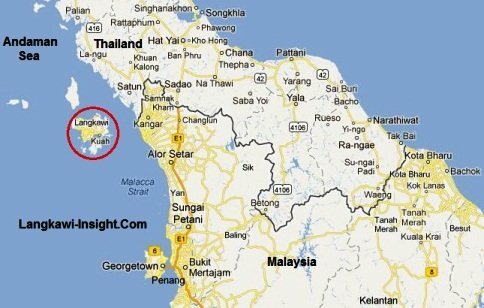 Here is a map showing location of Langkawi with respect to Malaysia's west coast. You can easily reach Langkawi by air, ferry and cruises from various places within and outside Malaysia. Check out Getting to Langkawi to know what are the travel options.